Bring your Trumpet every Friday!!! Get it ready the night before so you don't forget. How do I put my Trumpet together? 2. Never force the mouthpiece in or hit it with the palm. The mouthpiece will not come out. 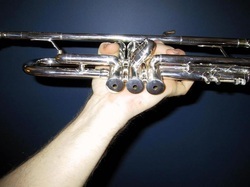 How do I hold my trumpet? The trumpet is held with the left hand. Fingers of left hand should go around the third valve casing and the thumb shoul go around the first valve casing. The instrument should be held so the valves are slightly tilted to the player's right and the left wrist kept straight. 3. When sitting both feet should rest on the floor and you should sit tall. How do I clean and take care of my trumpet? Treat you trumpet with care. Although it's made out of metal it is a very soft metal and will dent. 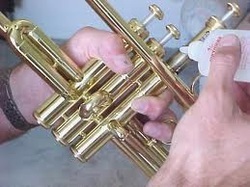 Any dents in the trumpet will cause serious playing problems. Valves should be oiled daily. Mr. Glaser will show you how to do this. Only 3-4 drops of oil are needed for each valve. Your valve oil should last the whole year. When putting your trumpet back in the case make sure to do it carefully and gently. Never store your book on top of the trumpet. It will cause the metal to bend and you won't be able to play. Where does the trumpet come from? A trumpet was made of wood in about 3000 BC and the silver and copper trumpets found in the tomb of King date back to 1341 BC. Various horns of different lengths and shapes can be found throughout history. They were generally connected with war or ceremonial events. 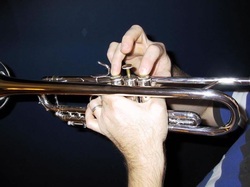 The trumpet has undergone fewer major changes in design than any other instrument. The trumpet was throughout history the instrument of royalty.